I am presently engaged in writing two 10,000-word chapters and half a dozen smaller, 1,000-word, features for a book to be published next year called Tommy At 50. My co-author, the designer Mike McInnerney, who designed the wonderful blue Tommy sleeve, is writing a similar amount. 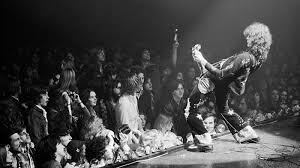 Mike’s brief is to write about the Mood and The Look, mine to write about The Music and The Legacy. All of which has caused me to listen again, several times, to Tommy, both my original vinyl edition on Track, bought in 1969, which I still possess but is a bit scratched and warped, and so sounds well ropey. In 1972 Track reissued the double LP on two separate discs, Part 1 (sides 1 and 2) and Part 2, with generic artwork but no libretto, presumably to make it more affordable. On this release the label read Tommy Revisited, and although I can’t recall how I acquired it I seem to have Part 2 of this in my collection. Although in better nick that the original, it’s still a bit dodgy. I also have a mint condition copy as part of the Phases boxed set of the first nine Who LPs on vinyl that was released by German Polydor in 1981, but for reasons I can’t explain (! ), this re-issue, though absent of scratches, sounds flatter than the original. Subsequent remastered CD versions sound much better, and I’ve been listening to these in my car this week and last. Writing about Tommy yet again isn't the chore I thought it would be, but I've got to be careful not to repeat myself. In truth I have so much research material here in my office - about a dozen books, all this vinyl, CDs and DVDs, what I can find on the internet - that I find I actually have too much to wade through. I'll post an extract here when I'm happy with what I'm writing. In the midst of this research I came across a few of my Who rarities, amongst them this rather strange Japanese CD that a friend of mine who visited that country brought back for me around 1990. It’s called The Who - My Generation on FIC Records, in what appears to be a series called Big Artist Album(s). Though it lacks ‘I Can’t Explain’ and ‘Anyway Anyhow Anywhere’, the 13 tracks are a decent selection and sound fine. The inclusion of 'So Sad About Us' indicates that whoever compiled it knew what they were doing. Oddly, three of the four tracks from The Who Sell Out, ‘Armenia’, ‘Our Love Was’ and ‘Miles’ are preceded by the commercials from Sell Out, as if they were intrinsic to the songs, which suggests the Japanese record company somehow copied them from the album itself. 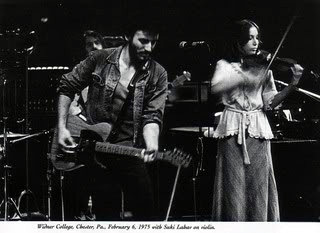 I was lucky enough to see Bruce Springsteen & The E Street Band five times before Born To Run was released, in Norfolk and Richmond, Virginia, in New York City at the Bottom Line club and the Academy of Music, and at the Westbury Music Fair, a theatre in Jericho on Long Island. I was reminded of this last occasion today when my Melody Maker review of the show popped up on Rock’s Back Pages, so I’m taking the liberty of cut and pasting it into Just Backdated. I remember the occasion well. I was driven there by Peter Philbin, Columbia International’s RR guy, a big Bruce fan who became a good friend of mine when I lived in New York as MM's US Editor. Weirdly, the gig was on a revolving stage in the centre of a room that held about 1,800 people. I don’t think it was sold out. The other thing I remember was that the place was run by Italian gangsters, and that the backstage area was patrolled by these olive skinned men in dark suits and ties with bulging shoulders, all of whom looked like extras from The Godfather. Philbin recognised this before I did and advised me not to make eye contact with them. We went backstage to chat with Bruce after the show but, as ever, he was tight-lipped, pre-occupied with the issues surrounding the release of Born To Run, of course. I wasn't to know this as the dispute between his manager Mike Appel and future producer and manager Jon Landau had yet to break out into the open. Bruce Springsteen, an artist whose talent has inspired respected critics to fawn like teenage groupies, took over the revolving stage of the Westbury Music Fair last weekend and showed yet again why one critic opined that the future of rock and roll rested on Bruce's bony shoulders. Eschewing the usual sleeveless tee-shirt in favour of a rumpled rugby sweater, and abandoning his fifties style shades, he led his band through a two and a half hour set that included a couple of two-song encores. Or was it three? By that time Bruce had virtually boiled over and taken the audience with him. Details get a little hazy at times like this. Since I last saw him, Bruce has found a new drummer, Max Weinberg, and piano player, Roy Bittan, and added a shapely violinist called Suki Lahav who not only improves the aesthetics of the set, but also adds considerably to the crushing atmosphere that Springsteen, street poet extraordinaire, is capable of creating. Unfortunately, I was informed, it was her last gig with the E Street Band. Springsteen's material alternates between whispered verses about kids growing up in New York and the surrounding area, and hard driven rock music propelled for the most part by Clarence Clemons, the giant black reed player, who rasps through his three horns in that old King Curtis manner. As a guitarist, Springsteen is more of a rock and roller than romantic poet. But his crazy movements back and forth, deliberately knock-kneed at times, are always fun to watch. This time, he jumped up rather precariously onto the organ midway through his encore of Presley's ‘Wear My Ring’. For me, the highlight of the set was not so much the hysterics at the end, but Bruce's first encore, the super-emotional ‘4th of July, Asbury Park (Sandy)’ with its French accordion and whispered passages about boardwalks, beaches and sea-side bars. Bruce altered the words slightly so that Hells Angels came riding in at one point, but ‘Sandy’ remained essentially intact, one of the most moving pieces he has written. He’s overdue for a third album, and Columbia are scratching their heads about what to do with their prodigy from Asbury Park. On Sunday’s showing, it’ll just be a matter of time before Springsteen is acclaimed by the people as well as the critics. Joining the shelfload of books published to coincide with the 50th Anniversary of the birth of Led Zeppelin is this upmarket coffee-table photo book featuring the work of Terry O’Neill, who has the lion’s share of pictures within its pages, Michael Brennan and my pal Baron Wolman who, by the way, was actually christened Baron and is not a member of the feudal aristocracy. Accompanying the best part of 200 pages of pictures, all but Woman's black and white, are text and captions written by Dave Lewis, founder, proprietor, editor, principal contributor and energetic promoter of Tight But Loose, the fanzine and website that stimulates interest in Led Zeppelin with the same kind of zeal that fired the group when they launched into ‘Rock And Roll’ at the start of many of the concerts covered herein. O’Neill: Jones so clear you can count the hairs on his head on page 24, Page the same on 25, and the Plant spread across 28-29, the latter leaving no doubt as to the singer’s masculinity; Page on 43, scraping his violin bow in the mist, Plant on 51, beckoning with his index finger in that peculiarly idiosyncratic way of his; Plant and Page together on 55, singing the chorus of ‘Whole Lotta Love’ (the only point in their shows during this period when it was possible for photographers to snap their heads together); Page on 67, on one leg, his body shifting in the opposite direction to his twin-necked guitar, which must surely have strained his skinny hips; Plant across 68 & 69, close up, giving his all, and over the page on 71, as handsome as handsome gets; a group shot across 83 & 84 during the acoustic interlude, Plant grinning across at Bonham, probably urging him not to sing; Jones on 89, a study in concentration on his peculiar triple-necked instrument; Bonham a blur on 92 & 93, maximum effort albeit perhaps a tad overweight; and 105, Plant all smiles, confidence abounding. 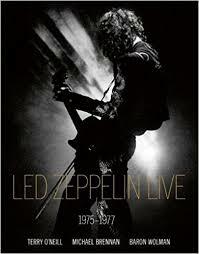 Led Zeppelin Live 1975-1977 is published by ACC Editions and though the RRP on the back is £29.95 Amazon is selling it at £19.95.